The last time you contacted your pharmacy or telecoms provider, did you interact with a chatbot or a live person? These days it can be hard to tell the difference, and that’s the point. Artificial intelligence (AI) technology – defined as a machine doing something a human could do – has evolved such that companies can effectively use it for customer service. In fact, the second most common use of AI right now is in service automation. According to IBM, it’s likely that by 2020, 85% of all customer service interactions will be handled without a human customer service representative (CSR). Service automation covers many types of service models, from field service technicians like the cable guy to retail contact centers and more. Its value proposition is easy to understand and coveted by all: AI in service automation improves the customer experience and decreases cost. If you have repetitive, monotonous tasks in your service process, and you’re looking to maintain or grow your revenue, your organization is a candidate for AI in service automation. Augmented messaging. First contact is with a chatbot that can respond to simple, common customer inquiries via website messaging tools. The bot gathers information it uses to respond by seeing where the customer clicked on the screen, analyzing their historic contact with the company, and by inquiries to the customer. For more complex questions, the bot can pass that information to a subject matter expert (SME). Customers get the information they seek more quickly, and the company can handle more inquiries simultaneously with less staff. Organized email queues. In the first contact, the customer emails a query or issue, and AI technology analyzes the text and routes the customer to the correct SME. Customer service improves as the response time goes down significantly, and so do the costs to the organization. The $10 it takes the company to respond to a phone call drops to $.15 per email. Voice recognition calls. When customers phone in, they interact with a chatbot who walks them through a decision tree in order to provide the information the customer seeks. If the customer’s question is not answered, or the bot senses frustration due to an increase in voice volume or change in tone, the bot routes the customer to a live agent. Contact center efficiency. The most widely implemented use case is with contact centers where with AI, a live agent can manage six or seven chat requests at the same time. The organization is able to handle the same amount of work with less staff, and customers get faster resolution. New AI technologies for service automation come to market almost every day, so organizations have a spectrum of solutions to explore. The AI you need may be as straightforward as a SaaS application. AI that’s highly customized to a company-specific task or workflow often requires programming to integrate systems and complete data integration. 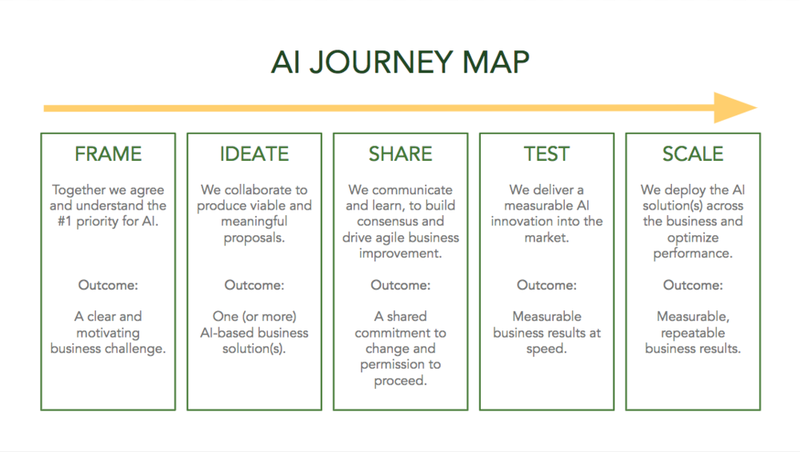 In all cases, the first step starts with your AI customer journey. Service automation will touch a lot of employees within your organization, including the CSRs and sales leaders, customer experience and marketing leaders, and IT team. Collaboration on selecting the technology and investing in change management strategy and execution are vital to the success of your AI initiative. McKinsey estimates that 29% of the tasks CSRs do today have the potential to be automated. That can seem threatening to employees who are vital to your customer experience, and are also hard to find. Be strategic in addressing not just the change in technology and processes, but also the potential need to retool and/or reduce your workforce. Have strategies, an identified project manager and a timeline for driving employee buy-in. If a trusted advisor could be helpful on your path to AI implementation, reach out to TG. We can provide strategic guidance at every step of the way beginning with your AI customer customer journey. We can also provide the tactical skills when needed to ensure your technology implementation succeeds in helping your company grow. Newer PostTESCHGlobal Forms AI/ML Partnership with DataRobot Inc.